If you want to study a “great songwriter” for our modern times, then you should definitely research the name “Max Martin.” He was born Martin Sandberg in 1971. The Swedish songwriter has written or co-written more than 20 number-one hit songs on the Billboard Hot 100 charts. Any of these songs ring a bell? Katy Perry’s “I Kissed a Girl,” Maroon 5’s “One More Night,” Taylor Swift’s “Blank Space,” and The Weeknd’s “Can’t Feel My Face” are all Max Martin creations. Oh, and don’t forget such classics as Britney Spears’ “Baby One More Time” and The Backstreet Boys’ “I Want It That Way.” As a songwriter, Max Martin is prolific. So what makes a great songwriter? They don’t have to be perfect, but they have to be process-oriented and flexible with their work. Great songwriters treat songwriting as work– albeit fun work, right? 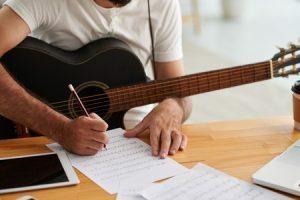 They write when they’re inspired as well as when they’re not… they probably have pages and pages of notes, ideas, lyrics and “parts” of potential songs. They pick and choose from their writings to come up with stuff that sounds good to themselves and others. Songs are about emotion, and great songwriters have that special something most people don’t have: they’re in touch with their emotions/emotions in general more so than the average person. They find ways to say stuff that most people couldn’t express themselves. They put into words what people think, or, more importantly, what/how they feel. And they do it in such a way that’s relatable, singable, and, typically, repetitive, clocking in at under 3 minutes or so. If you want to be a great songwriter, you have to have an affinity for creativity. You’re the type of person who likes considering different perspectives. For example, if you’re a white male, think about how you’d express your feelings as a black woman. If you’re an evangelical Christian, what would it be like to write a song from an Islamic or Jewish perspective? If you’re straight, what kind of gay love song would you write? You should always be learning about people, emotions, feelings and relationships… the more you know and understand, the better your songs will be. Want to help take your songwriting to the next level? Sing Like A Star can help you improve your songwriting– details here.